Primary and secondary schools outside the urban centers that struggle with no or unreliable power supply are the rule rather than the exception. We therefore see little schools that provide computer education in the rural environment. At the same time we see that the teacher that operate in these difficult contexts have very little computer and IT skills themselves. They have mostly been trained in computer-less environments themselves. Even if they have mastered the basic skills as a computer user, almost all miss the skills to set up a computer lab for the students. This situation puts a huge burden on efforts to bridge the digital divide. Where we need to train the young pupils and adolescents to engage in the digital world we leave large groups behind because of poor power supply and lack of skills to setup and run a computer lab. SolarCubed provides a solution that addresses these two issues. 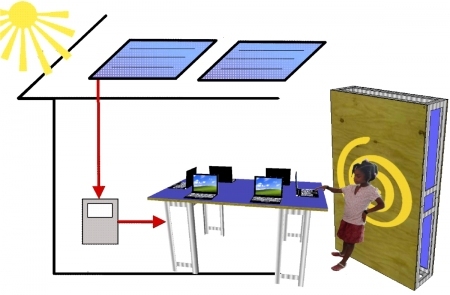 SolarCubed aims to bring the power and opportunities that information and communication technologies–like computers–offer to developing communities of the world.Their solution is simple set-up, all-in-one solution that combines two 90W solar panels and a DC charge controller, which enables computing in off-grid and resource constrained locations. The solution is simple and can be effective if the parts that are used are available in the local context. The fact that no installation is needed provides a good answer for the lecturers that have limited IT skills. In many rural schools in Africa this mean 1 or 2 year salaries of a teacher or up to a quarter of the yearly budget of the primary school. That will make adoption a tough decision. The SolarCubed solution does not seem to foresee in an internet connection, so the software and reference materials on the computers determine their usability. A computer alone will do little for the rural schools and it is hoped that the SolarCubed will be delivered with a wide range of textbooks and reference books (see this recent comment in the NYT) and at least an offline version wikipedia. The last challenge is well explained by Jordan Hu in this blog post. To get the maximum out of the new computer setup in the school, a teaching program for the teacher will also have to be included. In most cases the teachers have never been trained to teach computer classes to the pupils in their schools. We will therefore have to guide them, step-by-step. SolarCubed is an interesting new idea that addresses some of the real issues in ICT in rural schools but has a too strong technology focus. This focus needs to be merged with at least information and usage perspectives in order to provide the all-in-one solutions that is promised on the website. It would be great to see SolarCubed merge with content providers.